Today's consumer electronics (CE) industry has an estimated value of $354 billion per a Statista report (a high number compared to others I located). 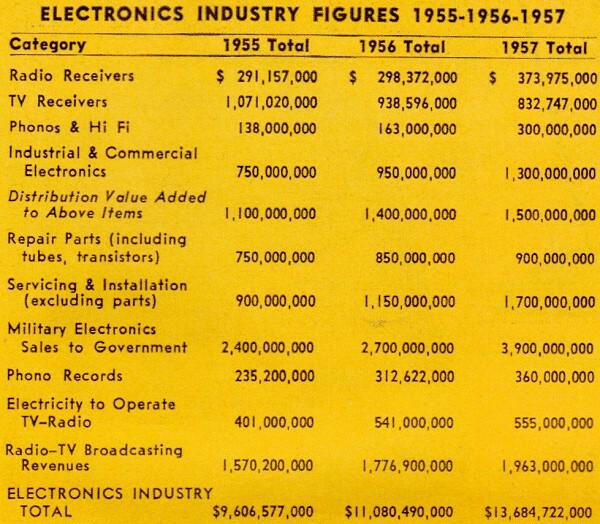 In 1957, according to this article in Radio-Electronics, the market value was reported to be $13.7 billion ($116 billion in 2014 dollars per the BLS inflation calculator). The world population in 1957 was 2.89B and grew to 7.10B by 2013 (per Census.gov). That means population increased by a factor of 2.45 while the CE industry grew by a factor of 3.05. Within the margin of error of marketing expert estimates, that represents essentially flat growth. Fret not, though, because while the total spending on consumer electronics per capita might have been flat over a span of nearly 60 years, the effective cost per electronics product and the vastly improved functionality and reliability of electronics products has increased by a much larger factor (I won't even venture a guess at a number). There is also a much greater worldwide participation in the CE market now, which makes even a flat growth in constant dollars an even better deal. This analysis illustrates how the same statistics can be used to support either side of an argument. I could have easily taken a pessimistic view and lamented at how the consumer electronics market has not grown in spite of all the research and product development invested. Whenever I see a report that at first glance looks dubious, I always look for the information behind the data. Often, there is a flagrant agenda in play meant to increase the financial and/or political fortunes of a select group. Take, for example, AGW. Seven years ago, in our November, 1951, editorial "Radio-Electronic Giant," we made the then-considered-rash forecast that by 1960 the radio-electronic industry would reach a fabulous $10 billion. That figure was based on a total dollar volume exclusive of military electronics. This highly optimistic forecast proved to be very tame and far too conservative. 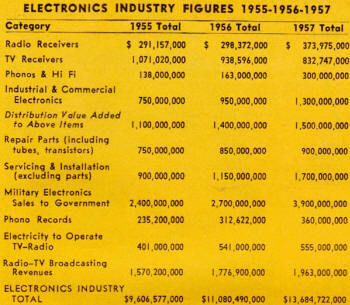 Long before 1960, in 1957, to be exact, the industry, in­creasing by leaps and bounds, had grown to a healthy total of $9.78 billion, exclusive of mili­tary electronics - and still had three years to go! If we add the military orders to this, we come to the astonishing total of close to $13.7 billion in 1957. There are those who feel that the industry will experience a severe setback in 1958. We do not share this pessimistic view. 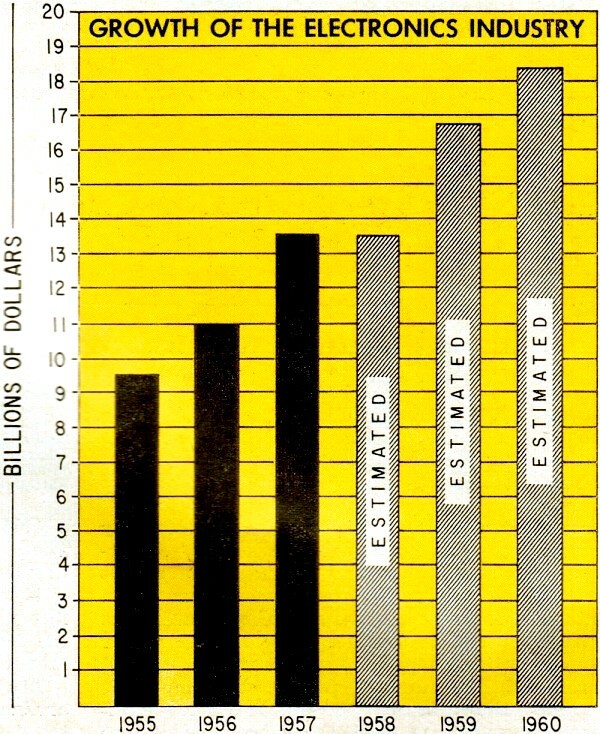 Indeed, a compilation of authoritative figures, made at the time this was written (late in May) indicates that the total effective recession the first quarter of 1958 for the industry was not more than 5% to 8%. This comparatively small decline may be wiped out entirely by the end of 1958, and it is quite possible that 1958 may exceed the 1957 total. Let us review here only the last three years to obtain a better perspective of our industry. All figures are factory values, except phono records, which are retail (see table). How does the immediate future appear from these figures - let us say up to the end of 1960? We have projected here a forecast which, in view of the past record of the industry, seems conservative. We feel certain that our figures again, as in the past, will prove low. Why: There are a number of excellent reasons why the industry MUST move forward, if we leave out of this forecast such imponderables as a world war. Natural growth. Even without the factors listed below, the industry must speed up due to its own growth momentum. Population growth. At present, the total US population is 173.8 million. By the end of 1960, we will number 180 million. More people mean an increased demand for everything - electronics included. New Inventions and Discoveries. If you look back only 10 years you will find that there were thousands of now familiar radio-electronic items not then in existence, from transistors to sputniks. Now, under the healthy and salutary pressure of Russian competition, we are really flexing our muscles and moving fast. The next three years will tell the story. Space electronics. No branch of the industry is moving faster than missiles, rockets and space vehicles. Electronics is the key to all of them. 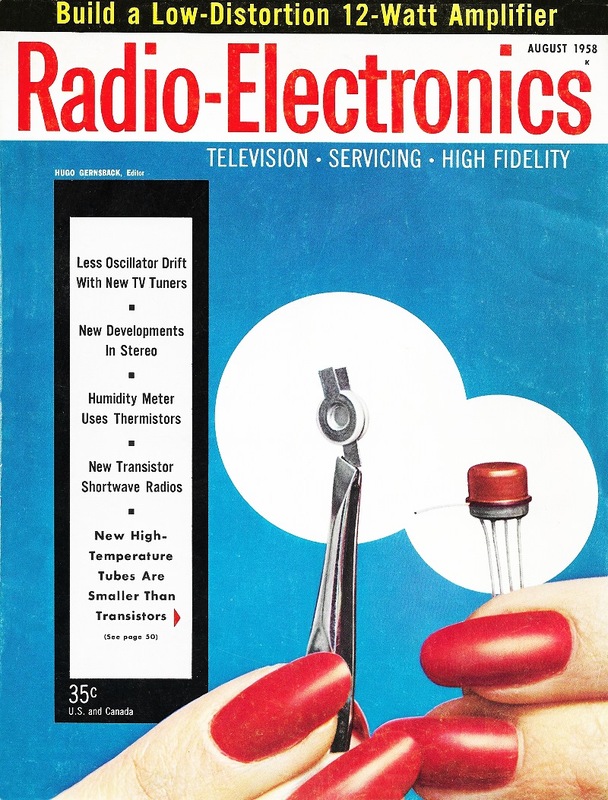 Here it is that radio-electronics really will dazzle the past. And when it comes to the highly sophisticated electronic instrumentation of the future, we really have not scratched the surface. Great breakthroughs are on the horizon, pointing to planet-wide radar, foolproof missile and space-vehicle guidance, collision proof aircraft and automobiles, positive electronic missile interceptors, and a host of others. All in all, there seems to be no limit in sight to future electronic expansion. - H. G.